We purchased this business in 1991 from ex-member Ken Scotton who operated it for a few years in Nelson County. 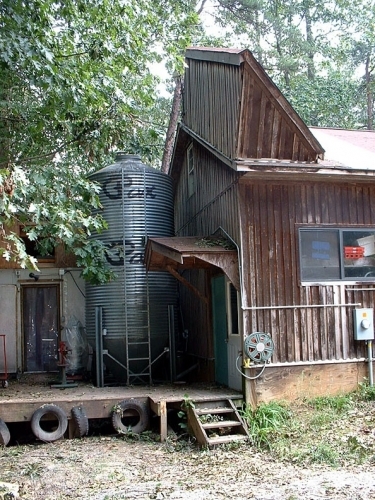 We built a new building to house the operation at the time of purchase. Since then the business has grown steadily to a level that has surpassed our hammocks business in income generated, as of 2011. Twin Oaks Community Foods has it's own website. Some photos of our production facilities are shown below. The Tofu Hut. Bucking the usual naming tradition for buildings at Twin Oaks we call this little soy dairy simply and affectionately The Tofu Hut. 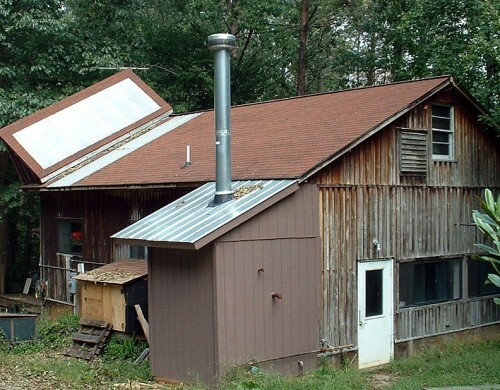 Note the solar hot water box on the roof. Tofu, soysage and tempeh are currently produced for sale in this building, as of 2005. Also, note that a major expansion of the business is under construction. 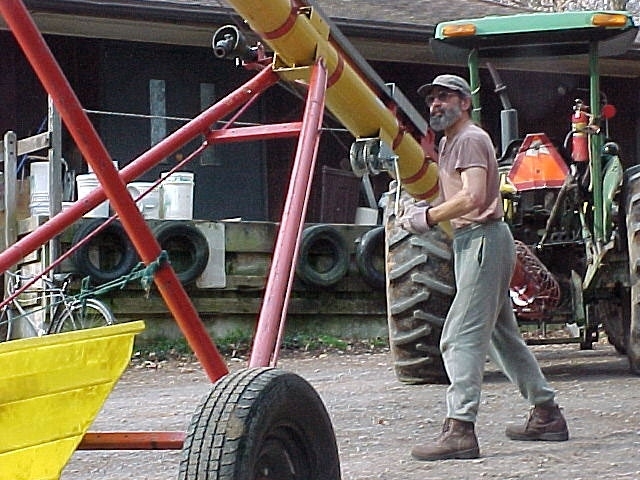 Soybean auger. Alder operates a grain auger to transfer soybeans from our large remote storage bin to the smaller bin behind the Tofu Hut. We use organic beans purchased from Virginia growers. Bean bin. Beans are delivered right out of this bin into barrels for soaking on production days. We have a much larger bin elsewhere on the property accessible by a large delivery truck. Steam gauge. 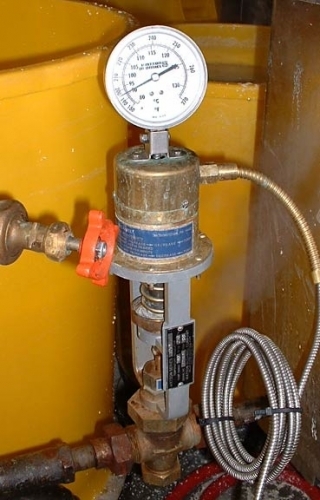 Gauge controlling steam on pasteurizer. Part of a major business expansion. We were lucky to have the expert help of Chris from East Wind Community fitting steam pipe. Stirring soymilk. Sean stirs coagulant into the freshly produced soymilk. Process chiller. 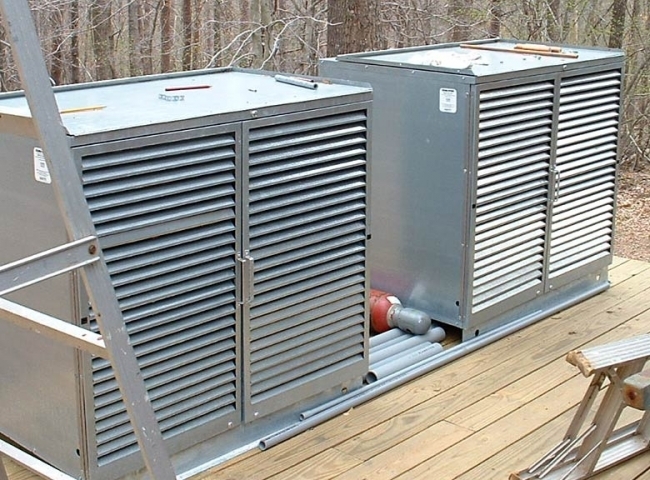 Outdoor chiller condensors: equipment added in 2005 to increase our production capacity. Delivery truck. 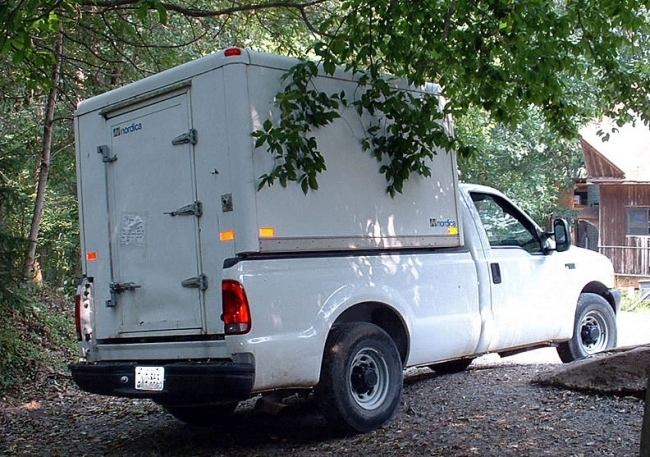 We use this refrigerated truck for sale to stores and restaurants in local cities. Much of our production is sent through distributors who cover a larger region. 2016 update: we have a newer truck that replaces the one pictured here. Since 1991 Twin Oaks has produced fresh tofu and other soyfoods for sale in our region and for our own consumption. Our brand is Twin Oaks Community Foods.